Salt Spring Island...a "pocket place"? I think so. As we all emerge into the "real 21st Century", with its mainstream evolution into the world of Artificial Intelligence, there begins to be a craving for simpler times. It's a search for what I call "Pocket Places". 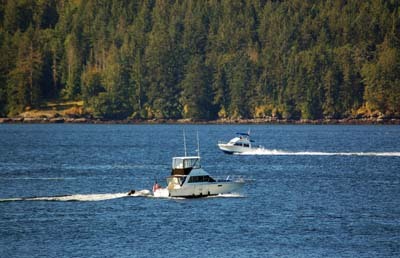 The Islands Trust, put in place in 1974 by the provincial government, with a mandate to "preserve and protect" the environmental beauties of the Gulf Islands, for the benefit of all B.C. residents, has also ended up by creating such a "pocket place". Salt Spring, under the Trust, has preserved a way of life...it's about real reality. The Trust's cap on growth did make the Gulf Islands into park-like entities. The internet era allows connectivity no matter where one lives. So...a blend of the 1970s past coupled with the ability to remain in the future. That's an interesting mixture. Apart yet not isolated. One hotel, one motel, nine resorts, eight Townhome developments...and that's "it". The Village of Ganges cannot extend its boundaries. The tiny commercial zonings at Fulford, at Vesuvius, at Fernwood cannot expand their boundaries. The zonings put in place in 1974 cannot be changed. Over time, their interpretation has been narrowed. The designated areas for subdivisions were pretty well done in the 1990s. It's infill housing now...people who have owned lots are now getting around to building and to moving to the island. So...it's perfect? Well...practically perfect. Check out the video that starts my May market analysis. Done by a Vancouver based travel writer, I think he caught the Salt Spring Island vibe. Three elementary, a middle, a senior school, a hospital, major grocery stores, three ferry routes (Vancouver, Victoria, Vancouver Island), two floatplane companies with regular sked flights to Vancouver (downtown and airport)...very accessible and yet a yesteryear lifestyle has been preserved.